Fairytales always fascinate girls and women for colorful surroundings and beautiful characters. If you want to dress up in eye catching outfit and express yourself like a fairytale character then mermaid attire will work best for you. Dive into sea mysteries and unfold many secrets with beautiful mermaid costume. Memories are always kept for lifelong time and special ocassions come for capturing these memories. Let her dress up in the most beautiful costume. 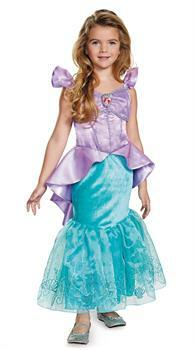 Looking for great fun and want to enjoy memorable time then go for Disney Storybook Ariel Prestige Toddler / Child costume.